For the current Mayor’s year rather than the more usual charity events, Ron and Carol Whittle have decided to raise funds for three Junior Sports Clubs. The intention is to help develop innovative ways of encouraging more Bridgnorth children to be involved in sport. This is in recognition that in addition to health benefits sports can be a route to lifetime friendships and better social interaction. The three clubs will benefit from any funds raised between now and next April. All Bridgnorth junior sports clubs, including senior clubs that have a significant junior section will be invited to “bid” for the funds available and in the Spring of next year Ron and his wife Carol will short list six clubs. Council will then be invited to decide the result, with the third place receiving 20% of the fund, second place 30% and first place getting 50%. The form of bids are up to the clubs but will need to show why clubs thinks they should be awarded funds including, for example, any particular projects they want to run or special events etc. How more children will be encouraged into sport will be key. It was intended to launch the fund at an event on 31st August, but unfortunately due to a clash of dates this has been cancelled. However look out for other fundraising events we will be running between now and April, including quiz night, curry night, Civic Ball, fashion show etc. Bridgnorth Town Council is looking for an experienced Supervisor to oversee the Direct Labour Force for 37 hours per week. Closing date for completed applications is noon on Wednesday 22nd August 2018. The public toilets in Bridgnorth will become cashless within the next few weeks. Bridgnorth Town Council have made this decision to try to prevent further damage to the toilets and theft of cash which has become almost a weekly occurrence. The changeover to cashless will inevitably see an end to this sort of criminal activity and thereby save a considerable amount of taxpayers money. The Big Lottery Fund have launched a new Building Connections Fund aims to support projects that prevent or reduce loneliness by increasing social connections. Catch Me Who Can - Bridgnorth Art Trail launches on Saturday 28th July at 11am outside Card Stores in the High Street. Be the first to find all the trains along the trail! Please see below Internal Audit Report 2017-2018, Annual Governance Statement 2017-2018 and Accounting Statements 2017-2018. Judging of this year's Community Pride Awards will be taking place on Wednesday 18th July around the town. An awards night will be taking place on Thursday 6th September in the Town Hall for all those who entered. From Tuesday, 17 July, 2018, patients across Shropshire who need urgent out-of-hours medical help or advice will need to call 111. The NHS 111 service will replace the current out-of-hours telephone access service provided by Shropdoc in line with national policy to provide a consistent, integrated approach to urgent care; but any patients that need to see a clinician out-of-hours will still be seen by a local GP or other appropriate clinician. 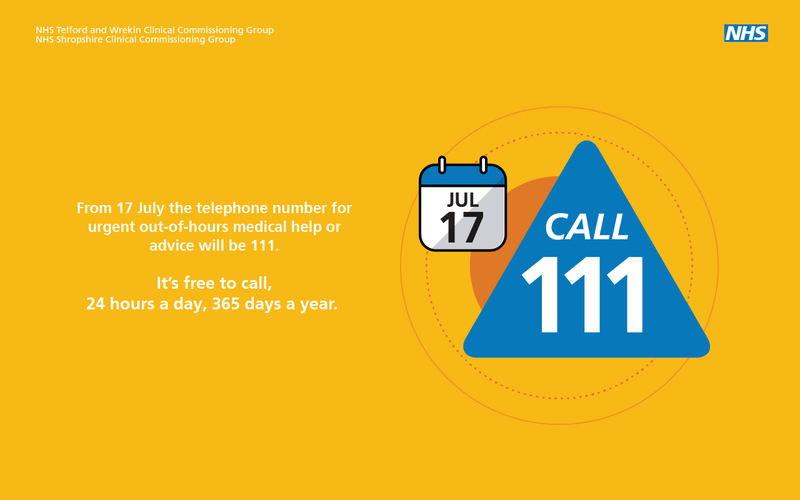 Patients in Wales should continue to use the Shropdoc number until NHS 111 is launched in Powys by the end of the year. The Internal Audit for Bridgnorth Town Council has been concluded for 2017-18 and a copy can be found below.